« Get On The Field! Buccaneers Ring of Honor member Jimmie Giles saw a thing or two during his impressive 13-year career. And now he plays very close attention to his beloved Bucs. Giles also chatted the other day with Rock Riley, host of the afternoon show that you should be listening to religiously, 3 p.m. to 6 p.m. on 1040 AM. 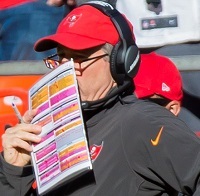 And it was there that Giles explained Dirk Koetter has a massive challenge before him. The tight end star of the 70’s and 80’s even called it a “problem.” Giles loves the talent on this Bucs team and acknowledges they are flat out loaded with pass catching weapons. Koetter, he said, must find a way to distribute the ball evenly. The distribution argument can go in many directions. Koetter is quick to say the defense dictates where the ball goes, but Koetter also says he knows players can get cranky when a lack of targets is accompanied by the team losing. Joe’s not worried about Koetter for one second. 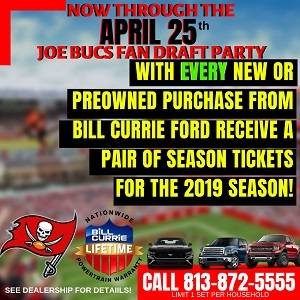 Joe is concerned, however, that the Bucs have a quarterback — America’s Quarterback, Jameis Winston — who is a little too obsessed with pleasing his teammates and is prone to forcing situations. Does Jameis have it in him to potentially tell Mike Evans or DeSean Jackson to shut the heck up and stop worrying about touches? That doesn’t sound like the same guy who admitted to needlessly and intentionally forcing passes in his 45th NFL start. For the record, Giles told Riley that he believes Jameis is a fantastic quarterback with an infectious positive spirit. Giles’ only concern is Jameis’ competitive drive leading him to dangerous, ill-advised decisions like the off-balance touchdown throw to Chris Godwin in Tennessee. Yes, Giles called that play out specifically. While it is a really good “problem” to have Im a little concerned about a HC letting the other team dictate how he plays offense. I understand what he is saying – defensive coverage is gonna leave someone open and that is where the ball should go -but it would be nice to impose your will on the other team once in a while. “Oh and Derwin looks as good as Joe 2.0 didn’t think he would be” let it go dude, he’s not on this team & prolly never will be. Mistake or not, it’s a done deal. I have zero problem with Winston forcing passes to Evans in the last game of a 5-11 season. I have confidence that it wouldn’t happen if that game gave us a shot at the playoffs. I’m not sure where all this antipathy against an NFL cliche…”take what the defense gives you” is coming from. It may sound and feel macho to say…scrw that we’re going to do what we do and simply dictate to the defense. Really? Let me see if I understand? So if you want to get the ball to ME13 because he is our best WR..you’d force it down the defense’s throat even if they had him triple covered and Godwin is running free and open? Why would you ever throw to a covered receiver instead of the open receiver. What’s the point to prove that you’re better than good? Isn’t success the ultimate goal. I just want to win. I do not need to be so dominant in a very balanced league to just line up and say watch us ram this down your throat. Those kinds of games rarely happen in the NFL where parity rules. You come around the curve in the road only to find the road blocked by a huge pile of dung…some people will make the right choice and go around it…others will not bend and they drive right through it. Both end up on the other side heading down the road but one smells like dung. Why do that? I think Jameis will make the right decisions this year…he’s seems to be growing in that area. Players are not going to beotch if they see JW hitting a wide open receiver…they will get frustrated if they are continually wide open and not getting touches. That will not be our problem. And as everyone already knows there is one EXCELLENT solution to the problem of who gets what touches. JUST WIN BABY AND IT’S ALL GOOD!!! Jackson won’t be an issue after this season. I love the reasonable Joe. Spot on summation of our talented yet troubled QB. I loved watching Jimmy Giles and Doug Williams when I was just a little Doosh. Andrew, stop worrying about the draft. It’s still to early to make judgments on the last two drafts, and even if you’re right, it’s not like every team has the perfect draft except us every year. ALL teams miss on high picks, not just us. You make it sound like Jason Licht is the worst GM ever. This team has the most overall talent as any we’ve had in at least the last 10 years. Talent acquisition is the GMs job. Check. Making it work is on the Coaches and the players themselves. Lichts job is secure, as it should be. The only thing that will get Licht fired is Jameis having a bad year. He’s the bell cow pick. Even if he struggles I think Licht will keep his job. Just look at our roster. Bad GMs don’t build the type of roster we have. Bonzai, you were correct and I was wrong about the blown coverage we debated in Friday’s game. Davis missed a coverage audible and should have dropped into zone. Dirk’s problem is that the offense moved and looked a lot better in the preseason then when he’s calling the plays. Dirk has been ultra predictable since moving to the sideline, and if he has any sense he’ll just hand over the play calling duties for the regular season. @Dooshlarue … “I loved watching Jimmy Giles and Doug Williams when I was just a little Doosh.” I can’t stop laughing Doosh (or should I say ‘Big Doosh’ since you’re apparently grown now?). @Joe … “Giles’ only concern is Jameis’ competitive drive leading him to dangerous, ill-advised decisions like the off-balance touchdown throw to Chris Godwin in Tennessee. Yes, Giles called that play out specifically.” But I thought Jameis knew the flag was on the defense & that he had a free play. Apparently Jimmie Giles didn’t buy into that. Neither do I BTW. I’m still shaking my head Joe because here we are with tons of receiving talent, yet our OLine has questionable depth & we have no viable backup to Peyton Barber (between the tackles) IMO. Plus when you get beyond Brent Grimes at CB we’re incredibly young (but hopefully very talented). So in a previous article we talk about trading away our seasoned QB backup (Fitz) instead of trading a receiver to beef up our OLine. Just can’t understand the logic. *when he’s NOT calling the plays…. “You need alot less of our “Gadget players” Little Hump and goofy lookin Brate and give more targets to our “explosive playmakers” OJ and Godwin. That’s exactly why when I see these fantasy football shows saying OJ or Godwin will breakout, I’m hesitant. They have a ton of weapons, hard to “breakout” with so many targets. While there is concern any time Jameis picks a target before play developes,my concern was why wait till the last game.to get Mike his record . Jameis likes the deep ball as much as as Koetter and there were too many questionable throws to djax deep. Big Doosh sounds about right! It’s not like Mike Evan’s is advocating getting the ball the most when he calls Godwin a future #1 receiver. I’m sure he wasn’t saying trade him either and that says a lot. Evan’s is NOT a pre-madonna and never was so Jameis wont EVER have to justify throwing to Godwin or D-Jax. In my opinion the chemistry of our top 3 receivers is one of the easiest in the NFL with the TRUE emergence of Godwin. the target like a good catcher and adjusts in the air to the ball. I agree that OJ and Godwin are important to the explosive potential of this offense. that are a good read on passing and QB play. Good playcallers dictate where the ball is going. Look at any good offense ie Falcons or saints. They always have wrs and rbs running wide open because all of the weapons they have. Hard for me to post anything serious at this point. I keep thinking about the growth of little Doosh. That a classic . When I think of Jimmy Giles the words “Cecil the Diesel ” always come to my. I,too loved watching him play. Jimmy Giles is spot on. I can only hope that JW never sees the field again as a starter. AND there is no way JW saw the flag when he made that wild throw….he has a hard time doing two things at once. Let this “preseason play calling” nonsense go. There is no game plan in preseason. vanilla defenses and coaches are putting players in position to evaluate. That’s it. Might as well say I am good at bumper cars, so sign me up for Indy 500. If the offense applies pressure early on then they can dictate how defenses play plain and simple. Being aggressive will force defenses on their heels. Gruden said you either apply pressure or feel it. We’ve been feeling it for too long, with this offense it should be able to apply it! godeep your hopes wishes and dreams will be crushed no later than the 5th game because the might sit him for the 4th. When that happens will you stop posting? Will you finally end our misery with your mindless and gutless dribble? But not this tool Godeep69….keeps flying around like a no see um. A pretty clueless little bug! Notice how we take the bait? Not really. I take the bait…cause she is MY tool to make me laugh! Eric – I don’t disagree with you on the play calling, except for the fact that I can predict what Dirk is going to do about 90% of the time, and that’s not just run / pass, it’s what direction, if it’s PA, etc. If I can sit here at home and watch a game and see Dirk stuck in a pattern that he repeats game after game after game, then what do you think defensive coordinators are doing? Dirk was not like that in 2015 when he was up in the booth, but once he moved to the sidelines, because became ultra predictable and very conservative with his playcalling. There’s a reason Doug Martin would have to break 4 tackles on every play just to get back to the LOS, and it’s because everyone in the world knew Dirk was going to run him up on the gut on every 1st down in the first half of games. Anywho this preseason there has not been the same old pattern, it’s been more varied. Dirk clearly isn’t anywhere near as good of an OC now as he was in 2015, and it’s why I said at the time, and still say, it was really dumb to let Lovie go, not because I loved Lovie, it was because you’re taking Dirk away from what he does best and you’re taking the guy who was working one on one with Winston, and removing that. It was a dumb move then and still is now, I just hope Dirk has enough smarts to realize he’s not any good seeing the field from the sideline and at the very very least allows the OC to have a lot of input as the game is going on. Rod you are a pretty smart football guy but I call you out on your 90 percent of the time. I’m not one to ever brag about the Bucs (unless we’re talking 2002), but this receiving group is potentially an all-time great group. Mike Evans is a legit top #1 WR, DeSean Jackson has been a legit #1 WR and hasn’t declined in ability. Chris Godwin is playing like he should be a legit #1 WR… then you have scrappy slot guy, Humphries, who caught 60+ passes last year as the forgotten man to round out the top 4 WRs… then onto Brate who got a long term extension and has been excellent and reliable… and then there’s perhaps the most talented player/freakish athlete on the roster in OJ Howard who literally looks like Superman when he’s on the field. That’s SIX legit targets in the passing game and only really 4 or 5 possible spots to put them on the field. That’s insane.